Carlos Morcillo began his career in the media industry in 2012 when he was a T. Howard Foundation intern at Speakeasy. Today, Carlos serves as Manager, Affiliate Marketing at NBCUniversal/Telemundo. He was hired in 2013, shortly after graduating with a degree in advertising and marketing communications from Baruch College in December 2012. Learn how the T. Howard Foundation introduced Carlos to careers in the competitive media industry, in his own words. I was first introduced to the T. Howard Foundation (THF) via a career fair at Baruch College, but also through my wife, who was my girlfriend at the time. She forced me to go to the career fair during a time when I was not focused on my career goals and professional development. That is where I met Karla Morrison, Senior Program Manager, Internship Program. After the rigorous application and interview process, I was lucky enough to intern with Speakeasy in the business development department. Scott Weiss, THF’s founder, is Speakeasy’s CEO. I secured my internship by demonstrating my ability to think outside of the box and ask smart questions. During my internship, I worked closely with account managers to find business opportunities and also helped with the maintenance of the company’s CRM system. Interning for a communications consulting company gave me the opportunity to develop skills from a professional perspective. I also learned to focus on building my personal brand and improve my communication skills in a corporate environment. Those concepts were stressed from day one at THF’s Summer Intern Orientation. I still use what I learned there on a daily basis. The support you get from the THF team and the connections you are able to build are priceless. Being a T. Howard Foundation intern and alumnus is something that will be a part of you throughout your entire professional career. The Foundation works tirelessly to expand its partnerships with top companies, and this only helps ensure that its name and reputation grows throughout the years. 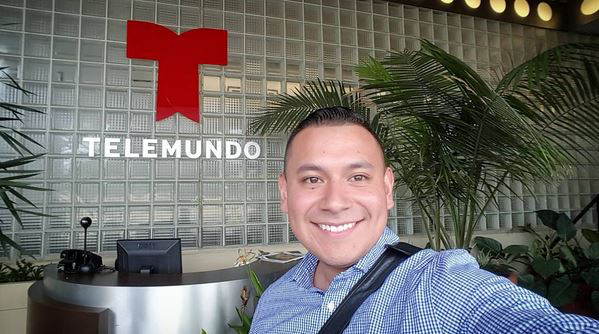 As Manager, Affiliate Marketing, I am the main point of contact for more than 50 Telemundo broadcast affiliate stations in the U.S. for all marketing-related issues. I work with multiple departments to supply our local stations with promotional strategies and materials for Telemundo’s novelas, specials and live sporting events, including El Señor de los Cielos, Señora Acero, Latin Billboard Awards, FIFA World Cup tournaments and the Summer Olympic Games. I must ensure that deliverables are being developed on schedule for activation, and sometimes that includes creating and delivering promos within hours. Despite the fast turnaround time, there is no better feeling than seeing your work live and available for the entire world to experience. Over the past two years, I have been able to grow as a mentor, which allows me to serve as a support system and resource to my mentees, friends and colleagues. Being a THF mentor means behaving and thinking differently because my guidance can impact someone’s decisions and their professional development. Television is a fast-paced environment and anything can change when you least expect it. You have to be prepared to adapt to change and maintain a clear mind to ensure a solution is identified immediately. Additionally, being able to anticipate problems and understand how the business works from all perspectives is crucial to ensure everything is working smoothly.